Adopt a Terrorist - Absolutely Brilliant! 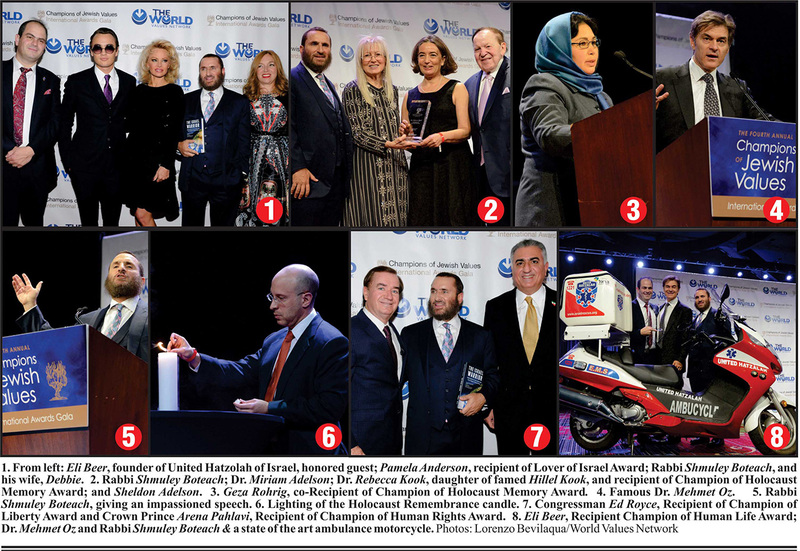 A who's who of Jewish philanthropists and defenders of Israel packed the ballroom at the Marriott Marquis in Times Square for The World Values Network's fourth annual Champions of Jewish Values International Awards Gala. The World Values Network is one of the leading organizations in the world defending the State of Israel and nearly 1000 supporters came to show their support. Food is always important at a Jewish gathering, and attendees enjoyed a delicious kosher buffet and sumptuous dinner, but the focus of the evening was recognizing a group of modern day icons who have used their talent, fame, wisdom and financial resources to perfect the world and celebrate life. The honorees also share the goal of the World Values Network to support, defend, and promote the State of Israel as the supreme embodiment of universal Jewish values. Our award-winning ads in the print media have brought to a broad audience the resounding message that a staunch defense of Israel is a defense of democracy. We've campaigned to get legislators to denounce Iran's threats against the Jewish people and to publicly condemn Hamas. And we have not been afraid to criticize the American government for legitimizing genocidal regimes like Iran or not recognizing the Armenian genocide. We exposed William Schabas � an infamous Israel hater � immediately after he was selected by the United Nations to lead the Gaza Commission to investigate Israeli war crimes. When Schabas resigned, he cited our ad as a reason why � proving unconditionally that we are making a difference. We recently launched a media campaign in the United States and Europe that exposed Sidney Blumenthal, a former White House top advisor, and his son Max who compared Israel to a Nazi state and the IDF to the SS. Our print ad that highlighted Israel's support for LGBT rights and its protection of the lives of gay men and women won a silver medal at the Pollie Awards, a recognition of advertising excellence sponsored by the Association of Political Consultants. We called upon Secretary of State John Kerry to renounce his statements claiming that terrorism against Israel was a product of Israeli government policy. Within weeks, Kerry appeared at a press conference in Israel with Prime Minister Netanyahu to disavow those and other anti-Israel comments. From also congratulated the honorees, �whose contributions to society represent the pinnacle of creativity, courage, determination and decency.� He also recognized the �esteemed group of award presenters,� which included dinner co-hosts Dr. Miriam and Sheldon Adelson and Judy and Michael Steinhardt and. Among other important philanthropic ventures, the Steinhardts were among the founders of the Birthright Israel program, which has brought more than 500,000 young Jews to Israel on a free 10-day trip that may very well have saved the next generation from continuing the disturbing trend of assimilation, intermarriage and alienation from Israel that we saw in the preceding generation. Meanwhile, the Adelsons, along with being the largest donors to Yad Vashem and the world's leading Jewish philanthropists, are also the largest contributors to Birthright and major contributors to many other important causes. Rabbi Shmuley continued: �Throughout the world there is a global onslaught against the Jewish people. Israel, the Middle East's only democracy, has remarkably become the single most hated country on Earth. The Israel Warrior takes no pride in having to fight. He, like King David before him, prefers a harp and lyre to a sword and shield. He, like the Maccabees before him, prefers to light candles to dispel the darkness then fling arrows at invading Greek armies. The Israel Warrior does not today, and has never in the past, erected a monument to a military victory, the way that Rome did with Titus's and Constantine's arch. In a gallery of stars it is difficult to single out one for special recognition, but His Royal Highness Crown Prince Reza Pahlavi is unique. The son of the late Shah of Iran, Pahlavi was only 17 when his father was overthrown by the radical Islamists who now rule Iran with an iron fist. His fate may have been different if he were not training abroad for the air force when the revolution occurred. Since then, Pahlavi has worked tirelessly from exile on behalf of his people, seeking support from world leaders to return Iran to its people and grant them the freedom, democracy and human rights they have been denied since 1979. For his unceasing commitment to these principles, he received this year's Champion of Human Rights Award. Each of the honorees provided a highlight in a different way. For example, Amir Ohana, the first openly gay member of the Knesset from the Likud Party and a former officer in the Shin Bet, was awarded the Champion of Human Dignity Award for his work on behalf of the Lesbian, Gay, Bisexual, and Transgender (LGBT) community in Israel. He formed the LBGT caucus in the Knesset and has promoted legislation to ensure the rights of Israelis from different sexual orientations. As someone associated with a right-wing political party, Ohana has been particularly successful in building bridges between the LBGT community and more religiously conservative Israelis. Back on the domestic side, Ken Kurson, a prolific writer, magazine entrepreneur and current Editor-in-Chief of the New York Observer, was recognized as this year's recipient of the Scott Turen Champion of the Human Spirit Award. In his introduction Ed Turen said the namesake of the award, his son Scott, �was a kind, generous, brilliant loving soul who had an encyclopedic knowledge of history and a fervent concern about world affairs.� Ken said that �Scott hated tyranny in all forms and stayed up at nights thinking about terrorism�in all its ugliness and ramifications. Often he and Rabbi Shmuley would talk about history and global affairs into the late hours.� The World Values Network is proud to sponsor The Scott Turen Award because its recipients �distinguish themselves in fighting human rights abuses, mass murder, and genocidal incitement.� This year's honoree, New York Observer editor Ken Kurson has been an inspiration to us all by loudly and boldly articulating the dangers of the Iranian nuclear program and its genocidal design on Israel and America. Another brilliant writer, Bret Stephens, a Pulitzer Prize-winning columnist for the Wall Street Journal, was honored with the Champion of Israel Award. In a typically erudite thank you speech, Stephens talked about the importance of maintaining journalistic standards, something too many of his colleagues fail to do when reporting on the Middle East. Stephens articulately explains Israel's difficult neighborhood and does not just rebut the ignorant critics of Israel, he also extols its too often overlooked virtues. He said that his positions on Israel are not a result of any bias, but his commitment to following the facts wherever they lead and, inevitably, the conclusion is that Israel is being portrayed inaccurately and unfairly by many of his colleagues. We could think of no more deserving recipient of the Champion of Liberty Award than California Congressman Ed Royce who as Chairman of the House Foreign Affairs Committee was named one of the most effective lawmakers in Congress by the Washington Post. Royce's father was part of the platoon that liberated the Dachau concentration camp, and the photos he took there have long been used as evidence to refute Holocaust deniers. Congressman Royce now continues his father's legacy of fighting for the freedoms that his father fought for . . . only he does so from his seat in Washington. Besides his longstanding commitment to addressing our national debt, protecting our homeland, eliminating pork-barrel spending, and strengthening education, Social Security and Medicare, Royce has been a leader in the fight against crime and victims' rights. Given his record on these issues, as well as his devotion to strengthening the U.S. relationship with Israel, it was no surprise that he would also play a prominent role in the fight against the catastrophic nuclear agreement with Iran. Congressman Royce continues to work to ensure that Iran does not get a nuclear weapon, and pays a price for his continuing support for terrorism and its efforts to destabilize the region. What can be said about Marion and Elie Wiesel that has not been said before? We honored them with Champions of the Children Award, which will add to the lengthy list of awards that includes the Nobel Peace Prize. We were thrilled to present the award to Marion Wiesel, who has been Elie's partner in his important work to keep the memory of the Holocaust and its victims alive and to ensure that �Never Again� is not a mere slogan, but an international commitment to prevent genocide. Eli Beer, winner of the Champion of Human Life Award, was the first honoree to ever arrive on the stage on a motorcycle where he was introduced by �America's Doctor� Mehmet Oz. To be more accurate, it was an ambucycle, a motorcycle equipped with medical equipment that thousands of volunteers across Israel use every days to save lives. Beer, who witnessed his first terror attack at the age of seven, grew up with a strong desire to help save people and became a volunteer medic. Though Israel is a small country, Beer recognized that it often took too long for medical help to arrive in an emergency. He decided to do something about it and recruited volunteers to be on call to rush to wherever medical help is need. His organization, United Hatzalah, gradually grew into a network of hundreds of volunteers who are connected to a sophisticated tracking system that alerts the nearest people to the site of an emergency. He now boasts that one or more volunteers can reach someone within a remarkable three minutes of receiving a call for help. In Jerusalem, the response time is an even more astounding 90 seconds. This organization literally saves thousands of Israeli lives each year. When he came up to receive his award, he brought two volunteers with him, one was an Israeli Muslim Arab who only a few days earlier rushed to the scene of a terrorist attack on a Jerusalem bus. The United Hatzalah model is so successful that it is now being adopted in parts of the United States. Every candidate for elected office talks about the importance of national defense and supporting the troops, but, since the end of the draft, very few go beyond rhetoric and put their lives on the line to defend our liberty. Tulsi Gabbard is one of the first two female combat veterans to ever serve in the U.S. Congress. But she took an unusual root into the military. She first ran for office and was elected to the Hawaii State Legislature when she was just 21 years old, becoming the youngest person ever elected in the state. A year later, she joined the Hawaii Army National Guard. In 2004, Tulsi volunteered to deploy with her fellow soldiers, becoming the first state official to voluntarily step down from public office to serve in a war zone. Tulsi served two tours of duty in the Middle East, and she continues her service as a Major in the Army National Guard. At the end of her tour in Iraq, she was awarded the Meritorious Service Medal. Not content with her already extraordinary accomplishments, Tulsi entered the Accelerated Officer Candidate School, where she was the first woman to finish as the distinguished honor graduate, and she commissioned as a Second Lieutenant. Still committed to service, she became the Military Police Platoon Leader in the Hawaii Army National Guard. In 2012, Tulsi was elected to ever serve in Congress and immediately earned the respect of her fellow Democrats. In fact, just days after being sworn in to her first term in Congress, Tulsi was selected to serve as vice-chair of the Democratic National Committee. Now in her second term in Congress, Tulsi serves on the House Armed Services Committee and House Foreign Affairs Committee where she is a strong advocate for national defense and for veterans. In recognition of her service to our country and ongoing commitment to maintain our freedom, we proudly presented her with the Champion of Freedom Award. This year's gala fell on Yom Hashoah, the day when we remember the six million Jewish victims of the Holocaust, the survivors and their families. Looking back at that dark period we find too few Americans who were willing to �speak truth to power,� as Elie Wiesel did when President Ronald Reagan went to Bitburg. As a result, instead of taking steps to save the Jews, such as bombing the railroad tracks leading to Auschwitz or the concentration camps themselves, President Roosevelt argued the best way to save the Jews was to win the war. Victory was achieved but at an unconscionable cost to the Jewish people. One man stands above all the rest, however, in the efforts he made to save the Jewish people while there was still time, and that man was Hillel Kook (1915-2001), known in the U.S. as Peter Bergson. Kook came to the states from Palestine in July 1940 as head of the Irgun delegation. When news of the mass extermination finally broke in October 1942, Kook and his colleagues established The Emergency Committee to Save the Jews of Europe. During the war years they worked relentlessly to bring news of the extermination to the American public, and to pressure the Roosevelt administration to adopt rescue of the Jews as a main war goal. To achieve this end they used the media in unprecedented ways � printing full-page advertisements in major newspapers around the country, staging pageants and organizing marches. He was aided in his campaign by prominent members of Congress, and well-known people of the arts such as Ben Hecht, Stella Adler, Dorothy Parker, and Marlon Brando. Finally, in January 1944, in response to the Committee's campaign, and, especially the lobbying of Treasury Secretary Henry Morgenthau, Jr., President Roosevelt established the War Refugee Board. The WRB was the only government agency established during the war aimed at saving Jews, and is said to have been responsible for the rescue of approximately 250,000 Jews. Sadly, we could honor Hillel Kook last week. He died in 2001, but we were privileged to have with us his daughter, Dr. Rebecca Kook, a political science professor at Ben Gurion University. Dr. Kook spends much of her time writing and lecturing about the relatively unknown story of her father's activities during the war and, in honor of her father, we were pleased to present her with the Champion of Holocaust Memory Award. Finally, what is a gala without a glamourous star, and we're not talking about Rabbi Shmuley. This year's Lover of Israel Award was given to Pamela Anderson. Over the past three decades, we watched Pamela evolve before our eyes from a role on television . . . to a movie star . . . and now to a dedicated philanthropist whose mission in life is to travel the world to help the vulnerable . . . and to support those who are trying to help. Pamela became a household name following her appearances in television shows such as Baywatch. While continuing her acting career, Anderson has become a dedicated philanthropist through the Pamela Anderson Foundation. She is a passionate advocate for animal rights and addressing climate change, as well as fighting to expose human trafficking and domestic violence. She also has a deep affection for Israel, where she has honeymooned, and served as a judge on Israel's version of Dancing with the Stars. Pamela calls Israel �magical� and says it is one of her favorite places. �A mixture of old and new, arts, music, and freedom. The people of Israel are interesting, aware, and generous. You can see they are very sensitive to the world's problems. Israel is a place everyone must experience. It's a progressive, wonderful example to the rest of the world.� Anderson is also a good sport when it comes to helping Israel, agreeing to take selfies with donors, which undoubtedly was a highlight for many.